We’ve spent the last month cleaning and optimizing our in-game simulation engine, Prometheus, to give you a far smoother experience, especially at later stages of the game. Patch time! We’ve spent the last month cleaning and optimizing our in-game simulation engine, Prometheus, to give you a far smoother experience, especially at later stages of the game. We have also started preparing the platform for modern age buildings that will start rolling out with the next major patch. We’ll discuss that closer to the time, so stay tuned! This patch introduces a new mechanic to quests with the addition of the Nuggola Tesla Quest. Previously, quests did not feel rewarding enough. As a result, we added a little something extra to this one to provide a more enjoyable experience for everyone. Successfully completing the quest will reward you with an immediate unlock of the next electricity-related Research Perk. The quest also includes multiple objectives for the first time. We are slowly progressing away from micromanagement to allow for more macro-level interaction. Happiness is the very first step in this direction, as it was previously tied to individual Nuggets. If a Nugget was upset, they would refuse to perform important tasks, which became annoying with so many Nuggets running around. The new system works on a more macro level, relying on different factors such as: available buildings, current events, and how you use your Creator Powers. 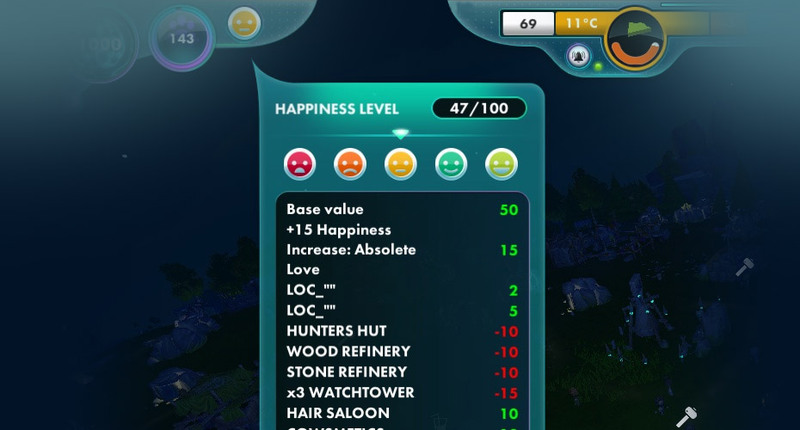 You can view how much each building affects Happiness by checking the information in the building’s panel/construction menu. We hope this system leads to a far more enjoyable experience, as we believe it gives you more control over what used to be a slightly unwieldy system. Happiness is divided into 5 states: Miserable, Unhappy, Indifferent, Happy, and Overjoyed. Each level has a particular status effect associated with it. For example, an overjoyed civilization will have a bonus to research speed, twin birth rates, and Creator Point generation. We have added subtitles to ensure absolutely everyone can enjoy the little tidbits, comments, and advice that the Narrator has to offer. We have added more than 900 lines of subtitles in this patch. Happy reading! The Stone Age Defense Tower finally received a medieval upgrade! It was a little lonely. Watchers will feel a little safer behind the improved walls of the Medieval Watchtower..
Another upgrade! The Medieval Fishing Hut is here. Too long have Nuggets struggled to fill their tiny boats with fish to feed the hungry masses. Seafood will become more plentiful with the medieval upgrade.